Our Town is focused on the environment and the quality of life. There are many parks for citizens and visitors to New Richmond. Firstly, Taylor’s Point Park, located along the shores of the bay, is an exceptional family park with a public market, picnic areas and paved track of more than 1,5 km for walking, biking and rollerblading. The Town of New Richmond is very proud of its natural reserve of a total area of 136,65 hectares in the downtown sector, namely the Réserve naturelle de l’Estuaire-de-la-Petite-Rivière-Cascapédia (the Natural Reserve of the Mouth of the Little Cascapedia River). Officially recognized by the Government of Quebec on October 30, 2013, this reserve includes a walking trail that allows visitors to admire the diversity of its flora and fauna. The Memorial Park, a site that commemorates the sacrifices of our veterans, is located at the intersection of the Veteran’s Street and Perron Boulevard. Its monuments, flowers and shrubs make this site a place for serious and solemn reflection. Melanson Park, situated at the intersection of Melanson Street and Perron Boulevard, and overlooks the sea and the river. Archbishop Arthur Melanson, a native of Trois-Rivières, grew up in New Richmond on the site that was to become Melanson Street, named in his honour. He was ordained on July 9, 1905 and become the first archbishop of the new archdiocese of Moncton on February 22, 1937. Archbishop Melanson was the first Acadian to receive the title of archbishop. He was the founder of the congregation of the Sœurs de l’Assomption. The Place du carrefour, a small urban park developed in 2012, is a emblem of the revitalization of the downtown sector following the reconstruction of the commercial artery that is Perron Boulevard. 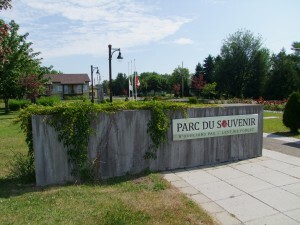 This park is a reflection of our progressive Town and has an electrical vehicle charging station that is part of Hydro-Quebec’s Electric Circuit. The Halte Bellevue, a seasonal tourist rest stop operated by Transports Québec, is situated along Route 132. Its location gives an exceptional view of the Town, the Bay of Chaleurs and the mouth of the little Cascapedia River.